I took the PTR out for several of hours of shooting. I tried making the test as controlled as possible so I could make up my mind if I should keep the rifle or not. I bought 20 round boxes of five different types of ammo. I listed them below and how many failures I had while I fired off a magazine of each. Please note that I only put 19 rounds in each magazine. 308 Winchester Federal Power-Shok 150 Grain Soft Point- No Failures. My Ptr-91 loves expensive hunting ammo. PMC Bronze 308 / 7.62 Nato- One Failure even though previously it would not fire more than one round at a time before failing to fire the next round. I attribute this to getting the rifle broken in. If anything changes I will let you know. 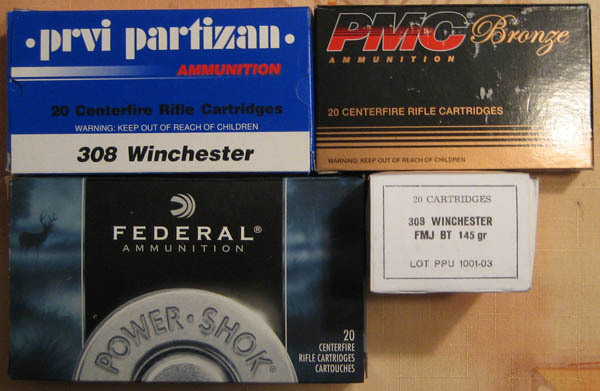 Prvi Partizan M80 145 grain FMJBT 2009 Production – My PTR-91 absolutely hated this ammunition. It only fired the first round and then failed to fire the second. After racking another round it failed to fire that round and the next. After that I had a triple feed bloody mess and I gave up on the ammo. Prvi Partizan .308 150gr Soft Point – After the previous experience I did not expect much from the PRVI 150 grain soft point. This ammunition fired flawlessly like the 308 Winchester. The commonality between the two types of ammo is that they are both manufactured as civilian .308 and not military 7.62. The PTR is manufactured to use 308 and not 7.62 so that makes sense. Hopefully once the rifle is broken in it will take all types of ammo. Australian 7.62 surplus ammo – I didn’t have a link because I traded my friend some of my PMC 308 for the ammo. The Australian surplus had only two failure to fires but the rest went off without a hitch. In summary the PTR-91 is a finicky rifle when it comes to ammo. I’ve only put two hundred rounds through it so it’s not broken in yet. I bought the PTR-91 because H&K G3’s are not available and H&K 91’s are hard to come by. In hindsight I should have bought a DSARMS FAL. I’m going to stick with this rifle for the time being but I would not bet my life on it. This entry was posted in Firearms and tagged ptr 91 reliability, ptr 91 rifle ammo issues, ptr 91 surplus ammo, PTR Ammo Sensitivity, PTR Firing Issue, ptr-91 reliability issues flutes on June 6, 2014 by GunGuy.